Applications Cooling water control valve for water-cooled air compressors, air compressor dump valve, explosive atmosphere valve, substitute for expensive electric solenoids. Available normally open or normally closed. Sizes 1/2", 3/4", 1", 1 1/4", 1 1/2", 2" - threaded connections (top connection 1/8" for 1/2" and 3/4" body sizes; all other sizes have 1/4" top connection). All bronze, with renewable stainless steel valve seat of full port diameter, renewable composition seat disc, neoprene-nylon diaphragm. Rust-proof steel bolting. Full port diameter means full capacity and low pressure drop through the valve. 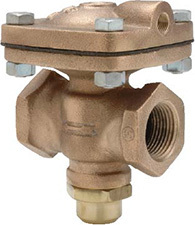 For maximum hook-up flexibility, diaphragm pressure connection may be indexed to any of four positions: over inlet, over outlet, or either side. Maximum body pressure 250 psi; diaphragm pressure 300 psi. Maximum temperature 180°F (82°C).